OK, so you’ve got the Amish sleigh theme going in your bedroom, or maybe you have one of our sleigh style entertainment centers and you want to continue the theme through the rest of your house. Well here is your chance. 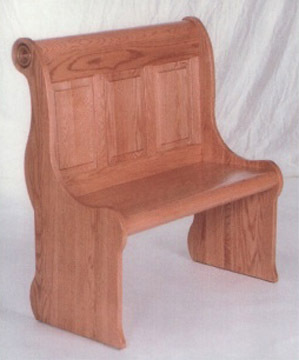 Pick up one of our beautiful Amish crafted raised panel sleigh benches for that perfect touch. The Amish like to cater to everyone, so we even have it available in three sizes and two different types of wood, providing plenty of options. Of course you know it is Amish made, so it is sure to become a family heirloom that lasts for many generations - order yours today.